For those of you not in the know, Banská Štiavnica is the most famous place that’s not famous in Slovakia. Its location is off the main Bratislava-Tatras-Košice trail but then it has to be: the town is in the rolling Štiavnica Mountains, in Central-South Slovakia, for a reason – that’s where, back in the day, Slovakia’s mineral wealth was concentrated. Well, Bratislava had the crowning of the Hungarian monarchs for centuries and Košice has, well, that famous Slovak writer Sándor Márai (well, he spent most of his time hanging out in Budapest but he was born in Košice) but neither city succeeds in so evocatively capturing an aspect of its history so well as Banská Štiavnica does its mining legacy. This wasn’t just any old mining town. 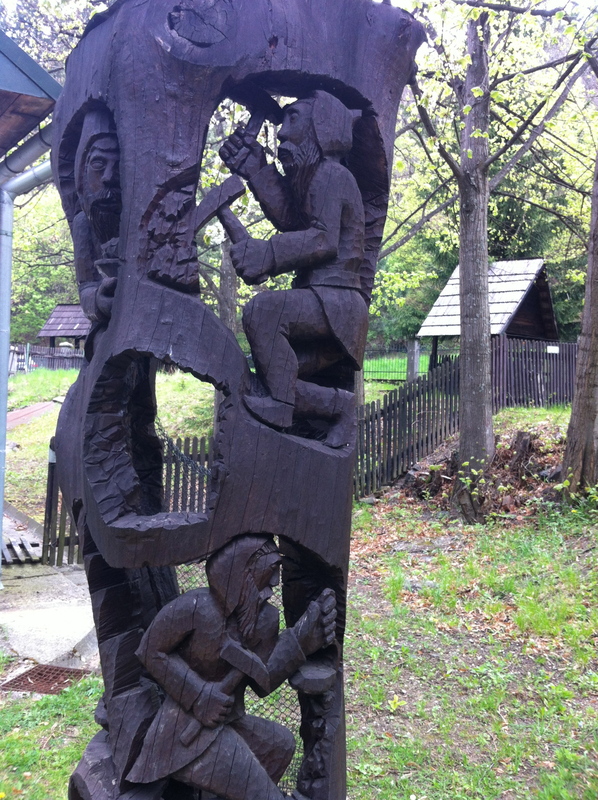 As a study of the intriguing mural in the centre (Radničné Námestie) just down from the tourist information office reveals, silver and gold was mined hereabouts since the middle ages. The prolificness of the minerals meant the town shot to prominence as one of the jewels of the Hungarian and Austro-Hungarian Empires: indeed, it was for many years the second city of the Kingdom of Hungary. Abundance of silver and gold made it not only a mining centre, but at the very forefront of world mining technology. In 1627 the first use of gunpowder in peacetime was carried out here. The world’s first technological mining school was founded here in 1762. The system of tajchs (small water reservoirs in the hills above town which store water high up to maximise flow efficiency; see our forthcoming separate post) was, once again, pioneered here. Oh, and coins for as far away as Africa were minted with gold and silver from the mines of the Štiavnica Mountains. You’ll know you’ve hit the right spot if you’re coming from the centre because of the gaggle of well-preserved old mining buildings, all in wood, at a sharp kink in the road. In several different buildings here are housed the miner’s church, and various mining apparatuses, as well as a lowdown of the area’s geology. There is plenty of information in English. There is also a great shop selling various rocks extracted from the mine (cool enough to warrant a separate post). For the really fun part, i.e. going down inside the mine, you have to wait for one of the more-or-less hourly guided tours (5-person minimum) – but the complex of other mining buildings provides enough to keep you entertained in the mean time. After listening to the guide (a former mine employee who knows loads of insightful little details about life as a mine worker) in the miner’s church introducing himself and playing you a short video (with English subtitles) you don yourself in cloak and hard hat and descend through the trees to the old mineshaft of Štôlňa Batolomej. The shaft was last used in the 1990s: no mining goes on here now. 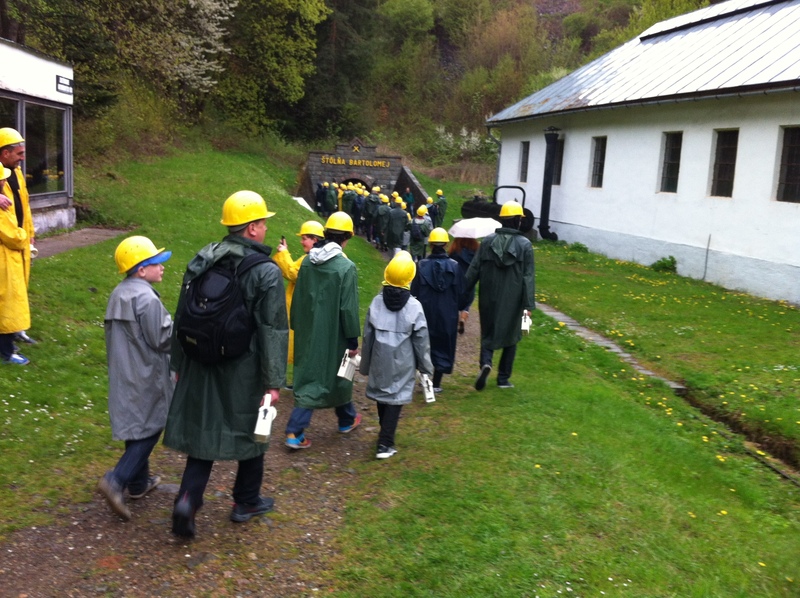 What commences is one of the best tours of an old mine shaft available in Europe today. It’s around 2km that you’ll walk along the old miners’ tunnels (not for the claustrophobic; there’s some tight gaps!) with a steep descent down a twisting ladder and a couple of places where you’re stooping almost to all fours if you’re tall. Along the way, you stop off in antechambers where a history of mining is exhibited as well as, perhaps most poignantly, a visit to the miners’ dining area, and the railway system that transported carriages of ore out of the mines. The normal guide only speaks Hungarian and Slovak: you’ll need to arrange an English guide in advance. If possible, take someone who speaks Slovak with you and go with the Slovak/Hungarian speaking guide who used to work in the mines and so has all the juicy tales. Before you ogle too much at the gold and silver and general medieval lavishness of Banská Štiavnica’s architecture, it’s essential to come here and see the dark, dank conditions in which it was extracted. Children will love it, too, as an open-air museum like this sure beats some dusty old exhibits. At some point along the way, you’ll probably hear the story of how it all began: the cowherd who, back in the day, saw two lizards in the fields shining, respectively, with gold and silver, followed them back to their holes and inadvertently made the region’s first mining discovery – and thus Slovak mining history. OPENING HOURS: 9am-5pm Tues-Sun; in holiday hours (July/August) there are also Monday afternoon tours at 12, 2 and 4pm. As a tour is obligatory (you can’t go down the mines yourself – you’d get lost in some small dark twisting passageways just like many miners did) be sure not to show up later than 4pm to see the mines.